Harvard University is one of the world’s most prominent research universities with significant historical prominence as well as influence across the globe. Established in 1636, Harvard’s campus includes many buildings registered as part of the Old Cambridge Historic District and the Harvard Houses National Historic District. Preserving and restoring Harvard’s architecture is a significant focus of the university. 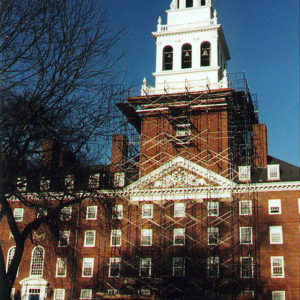 Initiated in 2012, Harvard launched their monumental House Renewal campaign, one of the largest capital projects at Harvard to date. The House Renewal Campaign aims to update and modernize the Houses while restoring and preserving their historic characteristics. Starting with Dunster House, M&A has been an integral part of restoring and preserving the Harvard Houses as described below. 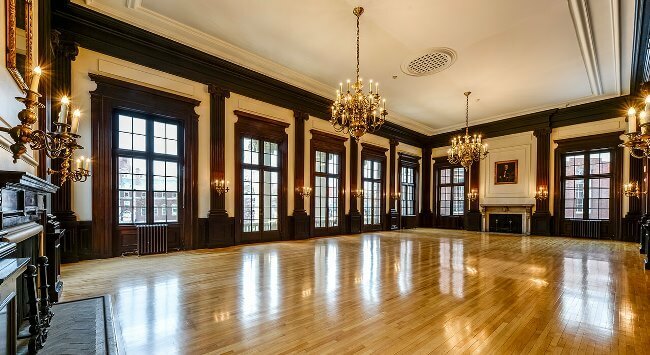 To date, M&A has completed intricate preservation and restoration work at Dunster House, Standish Hall, Lowell House, Gore Hall and 8 Prospect Street. While preservation of Harvard Houses has been a priority, M&A has also completed preservation work at other notable buildings on campus including the Knapfel Center and the Agassiz Theater, which received the 2015 Cambridge Historical Commission Preservation Award. M&A is proud to have worked on award-winning projects with renowned architects and general contractors to restore and preserve these architectural and historical treasures for future generations. 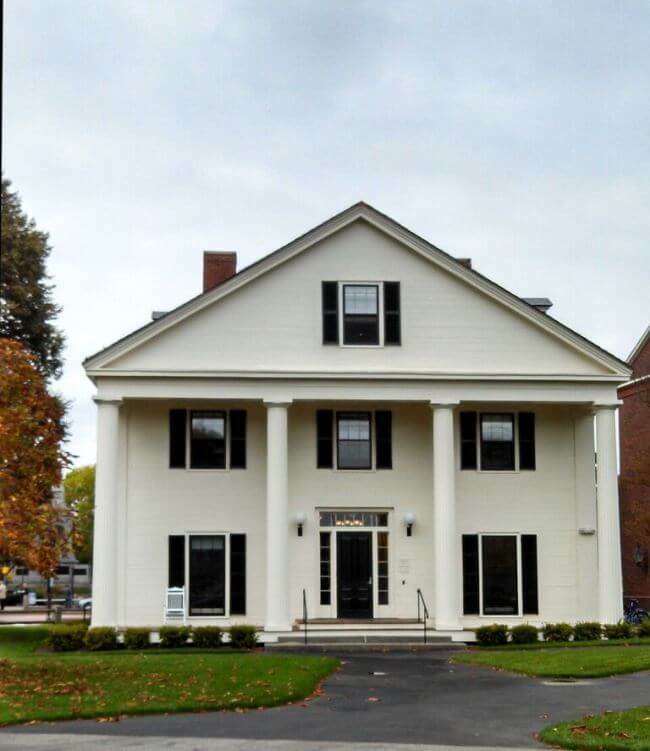 Dunster house is one of seven student halls known as the River Houses at Harvard, housing upperclassmen in a community setting that fosters intellectual and practical growth. Funded by Edward Stephen Harkness, construction of Dunster House was completed in 1930 and was one of the first of the River Houses to be built. Dunster House is of the Colonial Revival style so popular in the early twentieth century, particularly in New England. The Georgian-inspired steel framed masonry structure’s characteristic clock tower is inspired by the Tom Tower of Christ Church, Oxford. The footprint is a staggered-wing construction and reaches 6-stories at its highest. Dunster House is part of the Harvard Houses Historic District, a National Register Historic District, added in 1986. 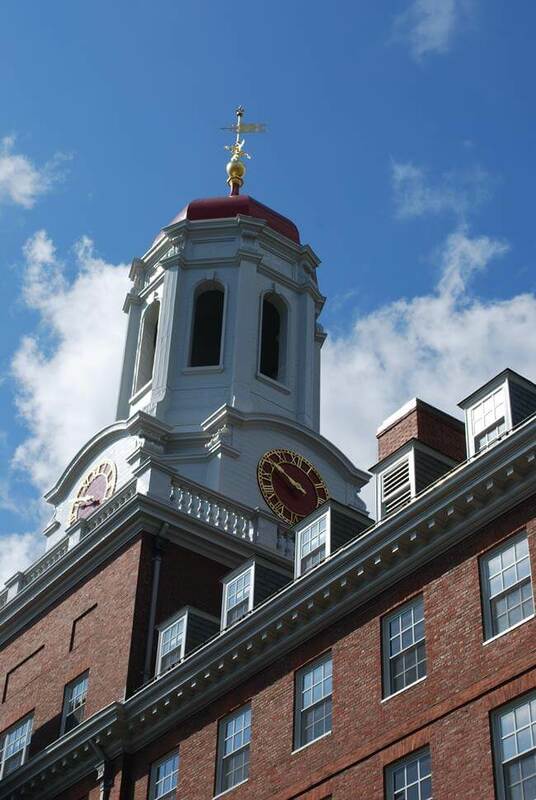 Initiated in 2012, Harvard launched their monumental House Renewal campaign, one of the largest capital projects at Harvard to date. The House Renewal Campaign aims to update and modernize the Houses while restoring and preserving their historic characteristics. 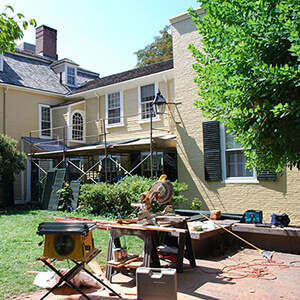 M&A’s involvement in the Dunster House renewal project involved exterior renovation to the clock tower, replacement of monumental window sash, exterior door restoration, and traditional space restoration. 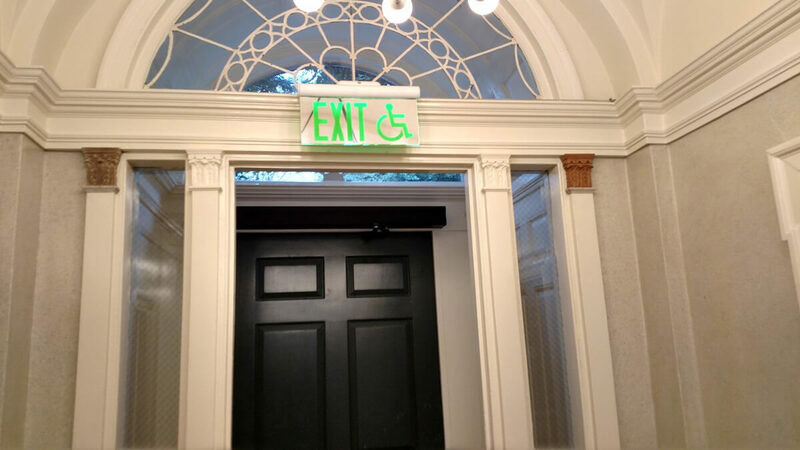 Due to Harvard’s preservation-minded approach to the restoration of Dunster House, much of M&A’s work involved removing, storing or modifying, and reinstalling existing wainscoting, chair rails, built-ins, columns and pediments, and even the clock faces at the tower themselves. Years of student use had left the traditional spaces worn, and while the design intent was to preserve the existing look and feel of Dunster’s historic spaces, careful wood restoration was required to ensure the historic fabric could survive another hundred years of use. Due to unknown existing conditions, it was necessary for M&A to remove all paneling and wall planking in the Dining Hall to expose the terra cotta walls underneath for abatement and update to infrastructure. M&A’s preservation carpenters carefully dismantled and labeled the entire Dining Hall, piece by piece, for storage in a climate-controlled facility. 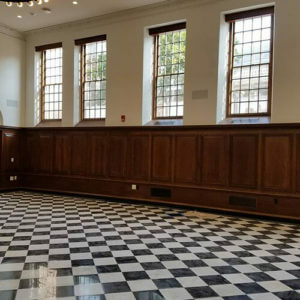 The Dining Hall was reassembled and refinished, and left the room looking refreshed, as if it hadn’t been touched since opening in 1930. The renewal of Dunster House was completed in August 2015 and re-opened to students later that same month. The well-received project has set the stage for future involvement for M&A in upcoming House Renewal projects. Noteworthy: Restoration of 12 unique exterior entries complete with complex pediments and ornate arch top glazed transoms. 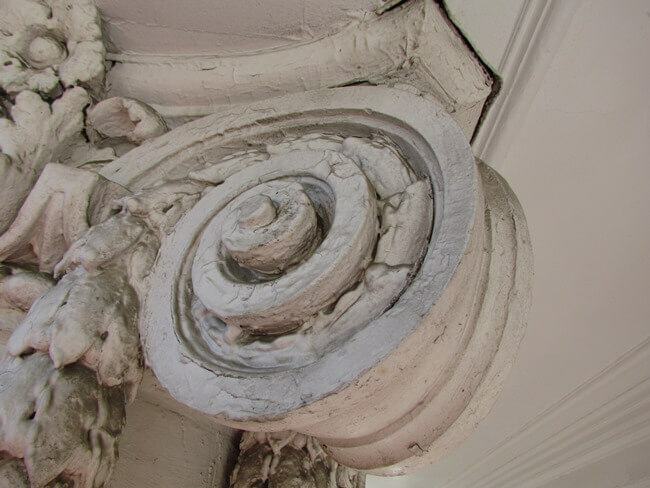 M&A’s Scope: Restoration of cornice, balconies, all exterior entries, plus select interior millwork restoration in the Resident Dean’s apartment. John Winthrop House or more commonly referred to as Winthrop House, is one of twelve undergraduate residential Houses at Harvard University. Winthrop House, home to approximately 400 students, consists of two buildings, Standish Hall and Gore Hall. Standish Hall was built in 1912 with funds from the gift of Mrs. Russell Sage, who named the building for her ancestor, Captain Myles Standish, a settler who arrived on the Mayflower. 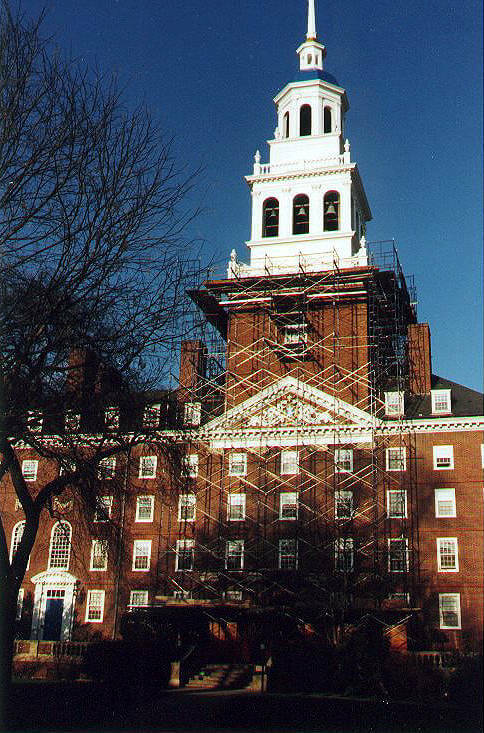 The work that M&A completed at Standish Hall at Harvard University involved primarily restoration of the wood elements of the façade. One small jewel of the building, a graceful archtop transom with nineteen panes of glass, was slated for demolition due to serious deterioration: wood rot at the bottom rail, broken curved muntins, and extensive use of caulking from previous repairs on the exterior face of the transom, which had effectively encased the existing muntins in numerous hard-packed layers. 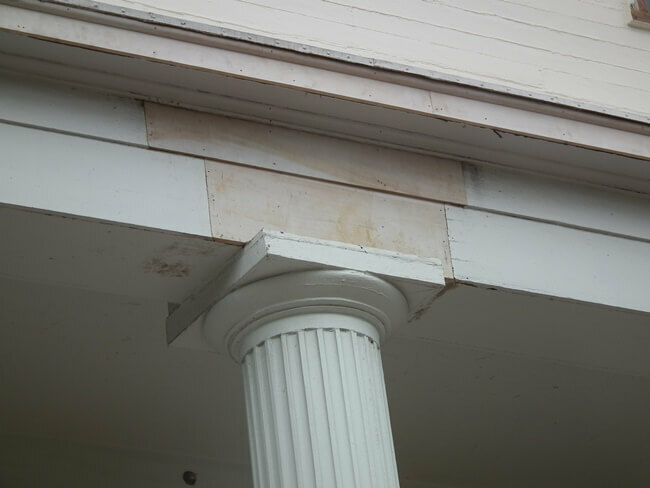 After assessing the relative costs of replication versus repair, it was determined that the best course of action was to preserve the existing sash. M&A carefully removed the paint and caulk holding the sash together and restored the transom, repairing all of the failed joinery and replicating the missing pieces of muntin. 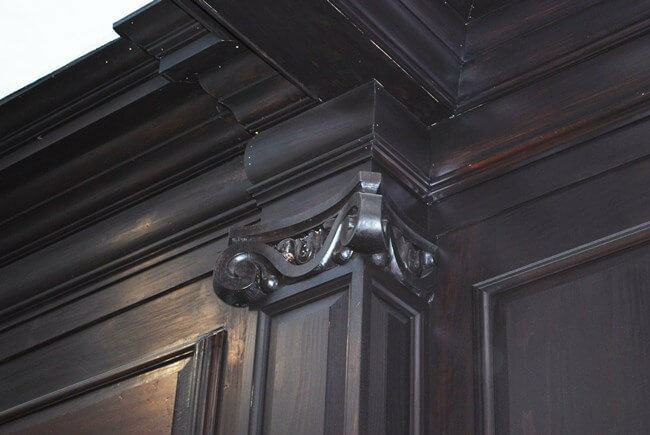 Another highlight of the project was restoration of the nearly quarter-mile long cornice, an ornate multi-part construction which included delicate carved foot moldings which M&A was able to replicate. Both east and west wings of the building boast very ornate balconies, complete with plaster finials and huge, carved scroll brackets. 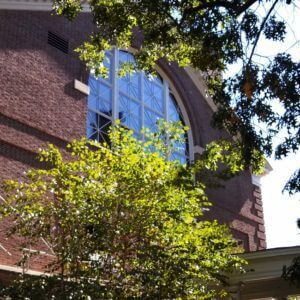 Structural steel and masonry repairs were completed by others, then M&A was able to rebuild the balconies and restore the brackets and finials. The rebuilding was mainly completed in M&A’s conservation shop, then the balustrades were reassembled for installation on site. Standish Hall has some very special entrances, with large pediments, columns and pilasters, many of which has suffered extensive water damage. 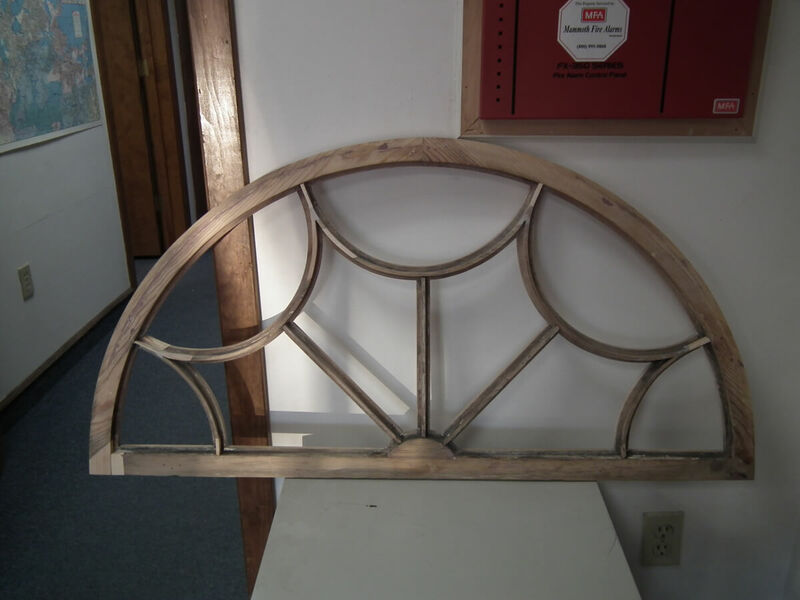 M&A was able to replicate custom carved and fabricated components and rebuild the entries. 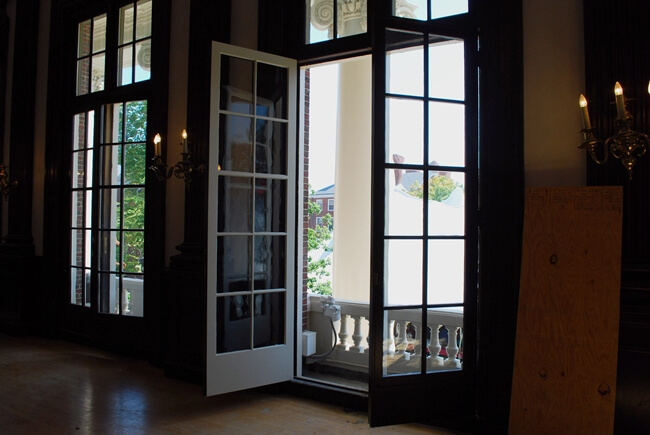 The radius French doors at the Resident Dean’s entry, with transom, sidelights and flanking windows, provided M&A with another restoration challenge. 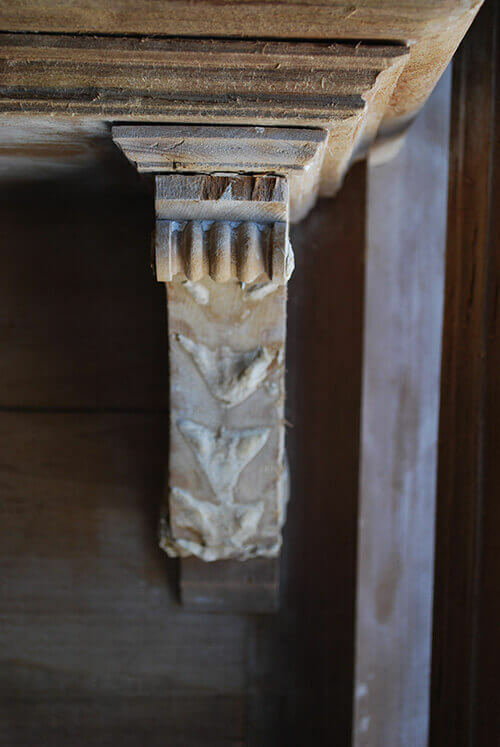 Finally, M&A was able to assist with some select interior restoration, including the restoration of the main staircase in the Resident Dean’s apartment, which featured carved and turned balusters. The coordinated efforts of many on this project resulted in the work being completed ahead of schedule. Noteworthy: Original Victorian windows had been cut up and reconfigured, but M&A rebuilt them back to their original size and shape. 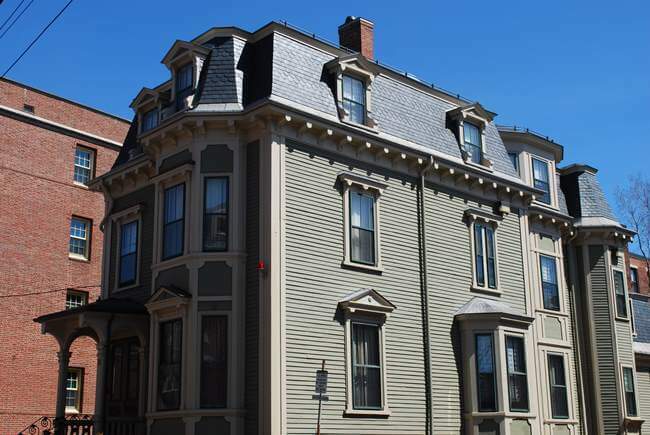 Part of the Mid-Cambridge Conservation District, the three-story Italianate Victorian house standing at 8 Prescott Street was part of a larger swing space project at Harvard University, which aimed to renovate existing structures on Prescott Street for both student and faculty use as House Renewal projects began. 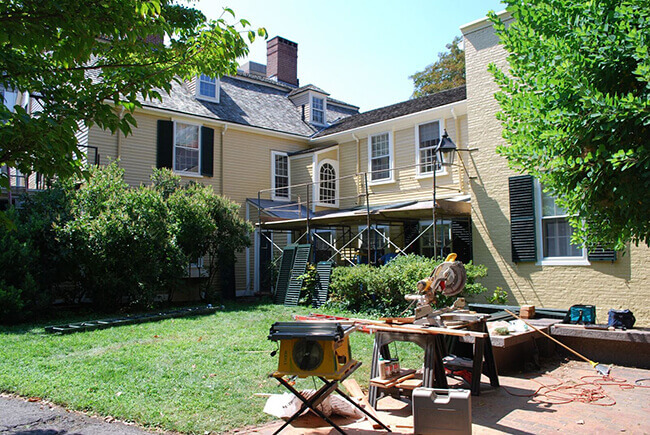 During the Undergraduate House Renewal project, 8 Prescott acts as a temporary Master’s Residence for Harvard House Masters. 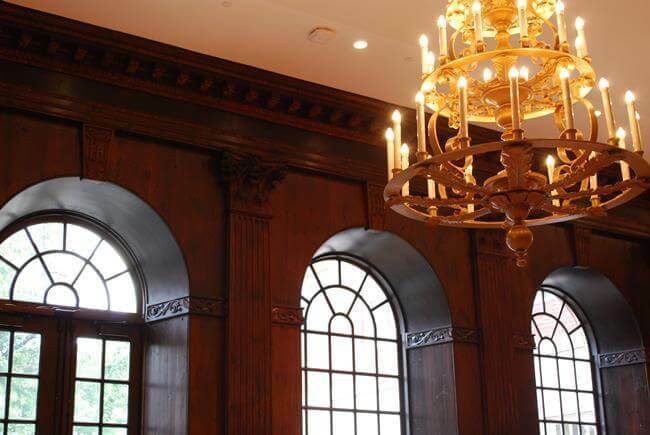 M&A was instrumental in multiple facets of the building restoration, most notably wood window restoration, wood entryway restoration, patching of millwork to match the existing, and fabrication of new interior and exterior historically accurate custom wood doors and millwork throughout the building. 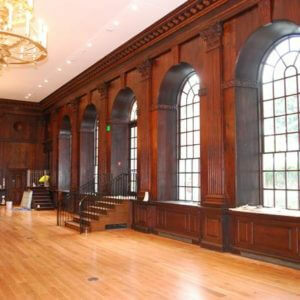 In all, M&A performed work to wood window sash at 65 openings. Prior to removing any wood window sash from site, M&A performed a comprehensive window survey, noting existing conditions and areas in need of restoration. Photo documentation along with written work scopes for each opening were completed and submitted to the general contractor before work began. The final report noted in detail every repair and replacement required, including which windows would receive replacement rails, replacement storm windows, salvage of existing hardware, replacement of spring balance systems, replacement of cracked or damaged glass, among many other instructions. 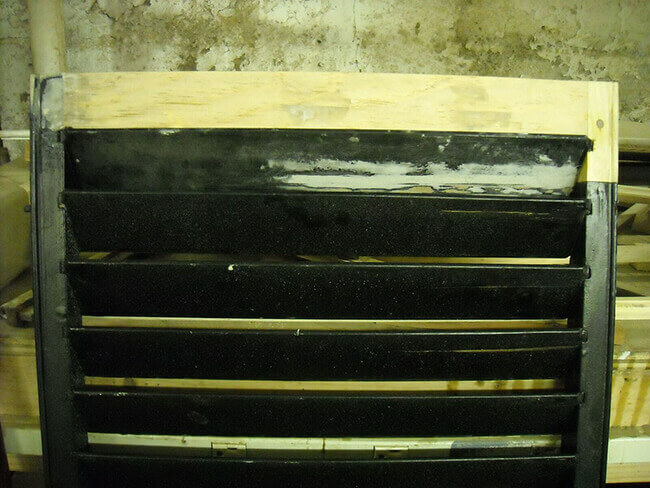 After the wood sash were stripped of all paint, they were returned to M&A’s shop for de-glazing of the existing glass and wood conservation of the sash themselves. 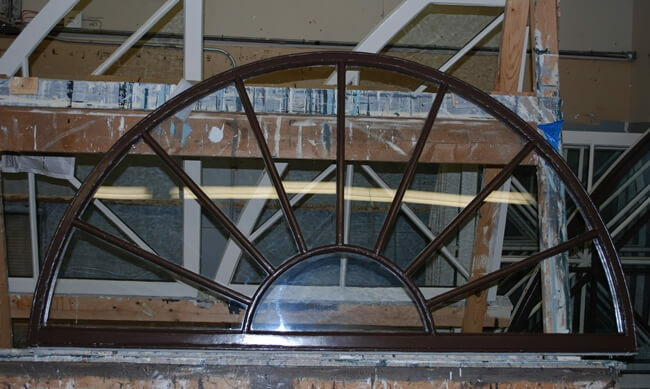 Upon de-glazing, M&A’s preservation carpenters discovered that the existing glass used in many of the sash was undersized, and that previous glaziers had used an oversized bead of glazing putty to keep the glass in-place. 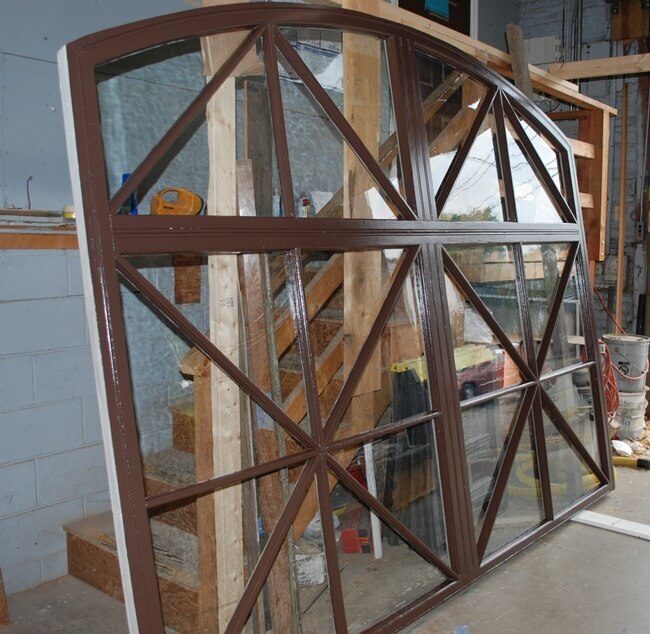 These conditions prevented proper re-glazing, and new antique glass was cut to the exact size of the sash and used in place of the undersized glass to ensure the best product possible. The beautiful structure is a glowing example of M&A’s attention to detail and exceptional craftsmanship. 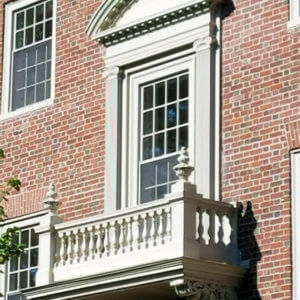 The award-winning structure was built by local architectural firm Coolidge, Shepley, Bulfinch, and Abbot as one of the first two Houses established by Harvard in the 1930s. 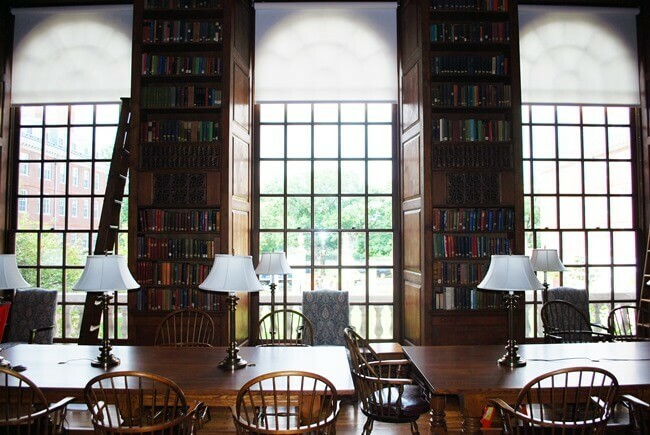 Built with funding from Edward Stephen Harkness as one of seven student halls along the Charles River at Harvard Lowell House houses upperclassmen in a community setting that fosters intellectual and practical growth. 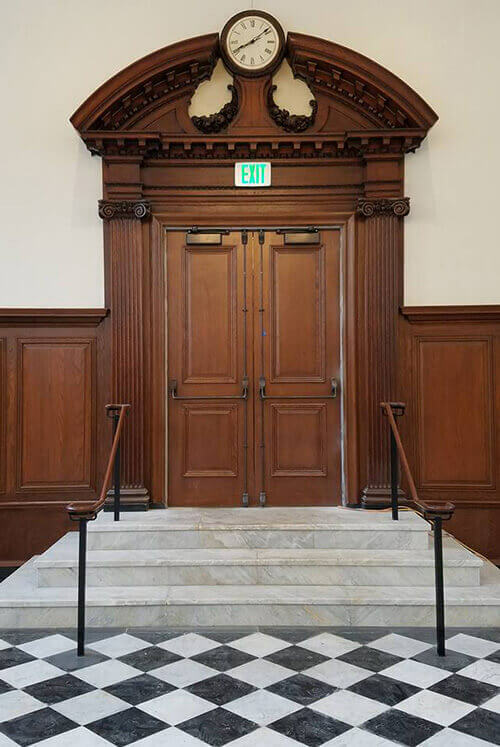 M&A’s Scope: The restoration work at Gore Hall is part of an ongoing effort at Harvard University to renovate and restore Harvard’s original houses for students. 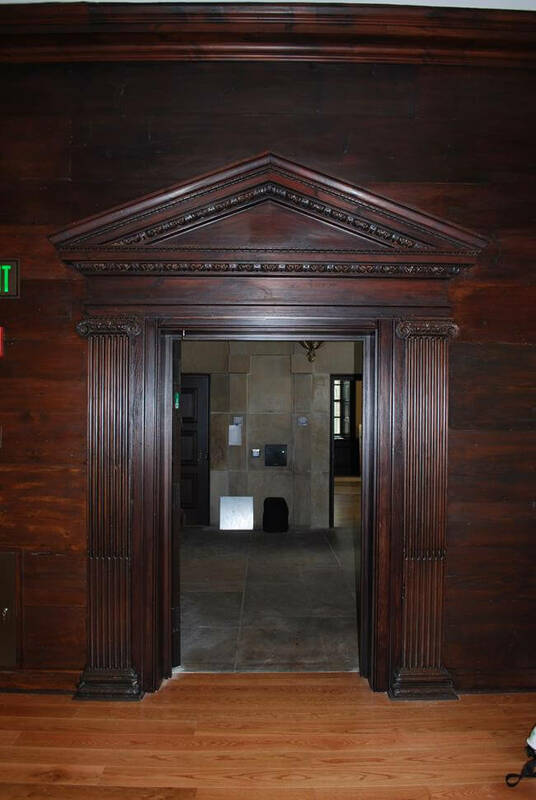 The work was a combination of restoration and replication of historic paneling, millwork and doors in the Winthrop House dining room, Junior Common Room and Suite F14, the senior year dorm room of John F. Kennedy. 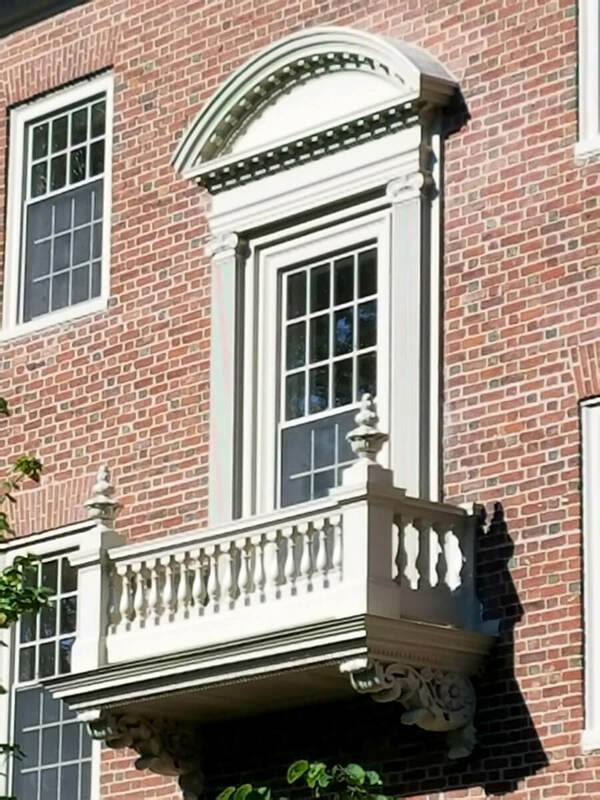 John Winthrop House or more commonly referred to as Winthrop House, is one of twelve undergraduate residential Houses at Harvard University. Winthrop House, home to approximately 400 students, consists of two buildings, Standish Hall and Gore Hall, originally freshman dormitories built in 1912. The original Gore Hall, a historic building on the Harvard University campus, was designed by Richard Bond and was built of Quincy granite in 1838. It was named in honor of Harvard graduate and Massachusetts Governor Christopher Gore. In 1913 Gore Hall was demolished and its name was transferred to a freshman dormitory being built. Gore Hall was home to President John F. Kennedy during his senior year and his dorm room (Suite F14) has been maintained in Gore Hall as a private room for guests of the university, ranging from actors to politicians. M&A Architectural Preservation was part of the team working on this suite to restore it and make it more accommodating to visiting guests. The study is furnished with a plaque commemorating the late President Kennedy, a leather couch, and a large rug, along with framed photographs of Kennedy. The Kennedy Suite’s bedroom has two twin beds, as well as a shelf of books written by and about President Kennedy. Restoration of the magnificent oak paneling in the dining hall and junior common room. 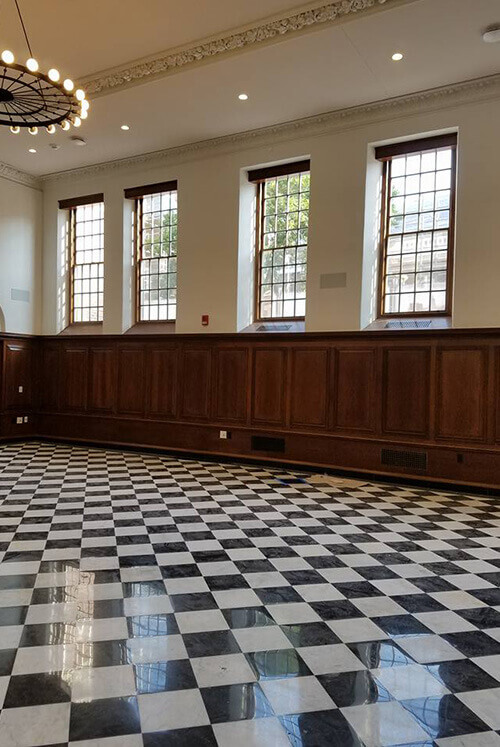 Fabrication of new panels was completed to match the original oak paneling while accommodating the new heating system, and existing paneling, seating and shelving was removed, restored and all reworked for installation in the new heating configuration. The new millwork components in each room were seamlessly blended with the original components by custom staining and finishing. 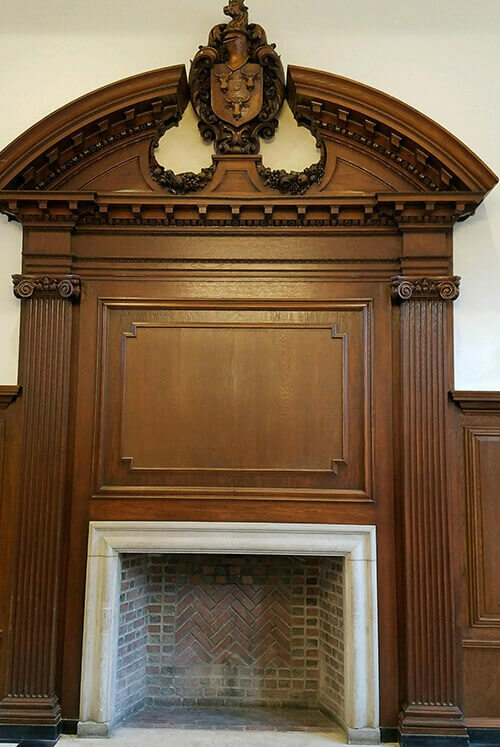 Removal and restoration of several fireplace mantels, including fabrication of new wood and plaster components to match originals which were damaged, and the merging of two separate surrounds into a seamless new configuration to fit the enlarged fireplace. 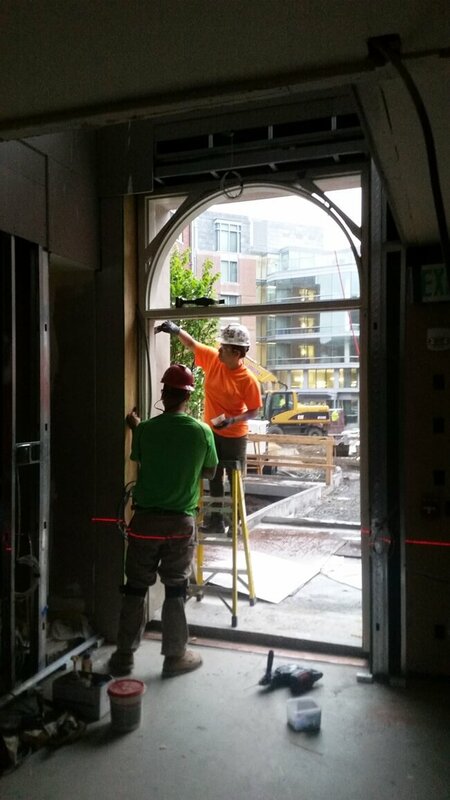 Monumental window openings were restored, including removal and refitting of matching paneled jambs. Restoration of the millwork and shutters in the historic JFK suite – Suite F14. 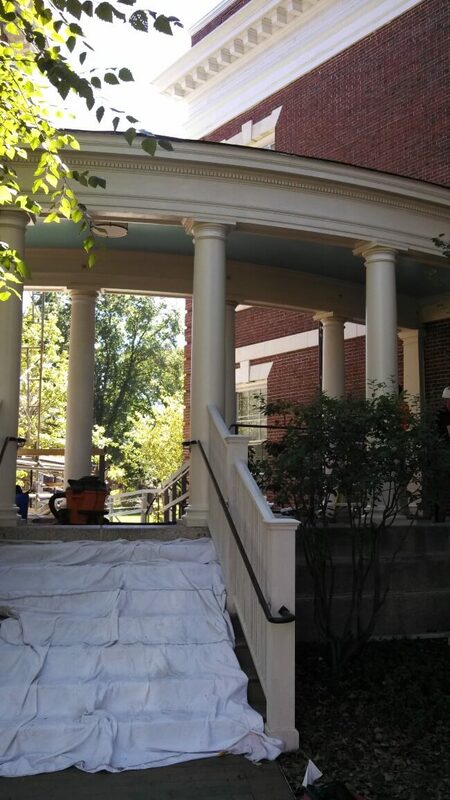 Restoration of exterior entries throughout Gore Hall, including doors, frames and transoms. The first building to grace Radcliffe Yard, Radcliffe Gymnasium, now known as the Knapfel Center, was designed and built by nationally-renowned Boston-based architects McKim Mead & White in 1898, just three years after finishing their best-known Boston structure, the Boston Public Library. Once built, it housed a marble-lined swimming pool and an indoor track. 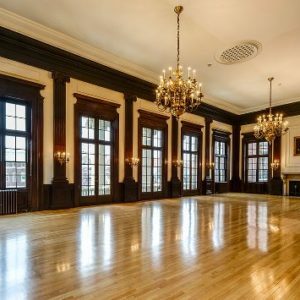 Over the years, the use of the space has changed, from gymnasium to rehearsal space for Harvard’s dance program to office space, all the while making minimal changes to the building’s interior. 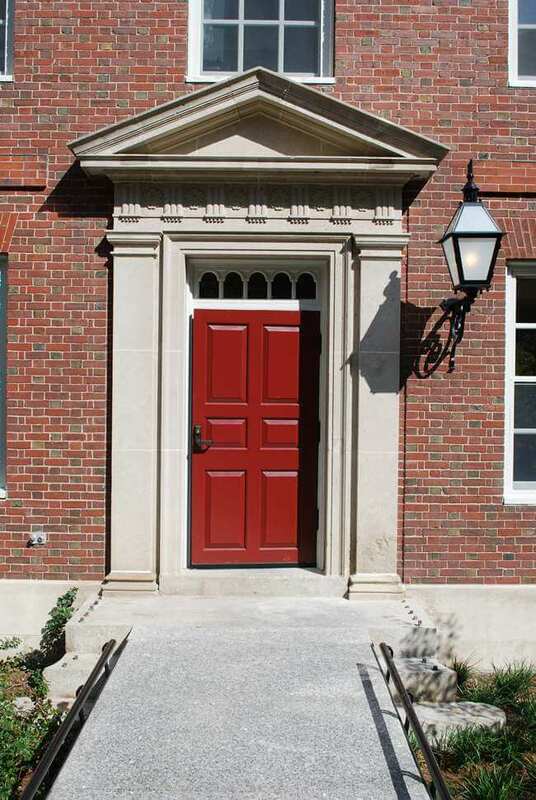 The building underwent a major interior restoration in 2006, which transformed the gymnasium into a lecture and event hall for the Radcliffe Institute. 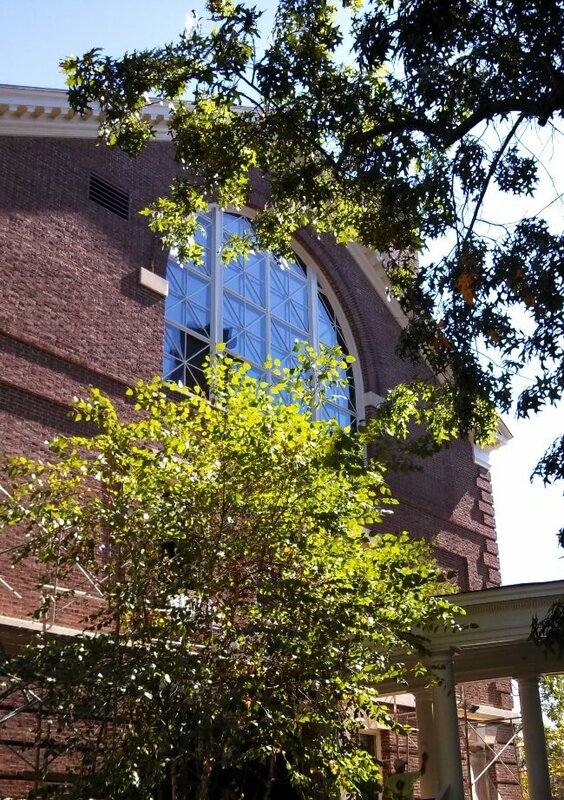 In 2013, the Knapfel Center received additional exterior restoration, including masonry and wood repairs. 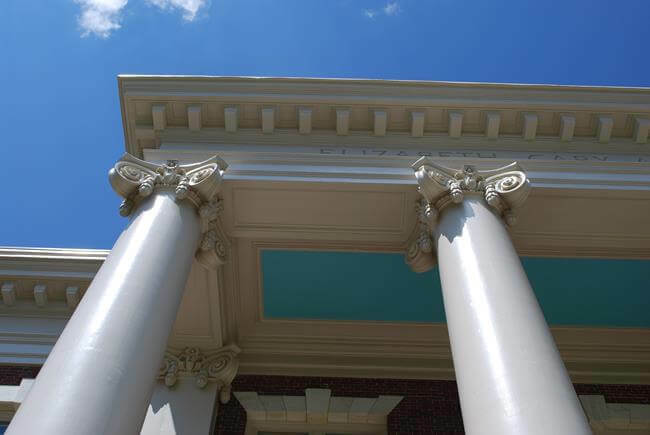 M&A was an instrumental component of the monumental wood window restoration and exterior carpentry restoration, which included the replication of nine column bases at the walkway between the gymnasium and the Agassiz Theater as well as the wood railing at the entry portico roof. 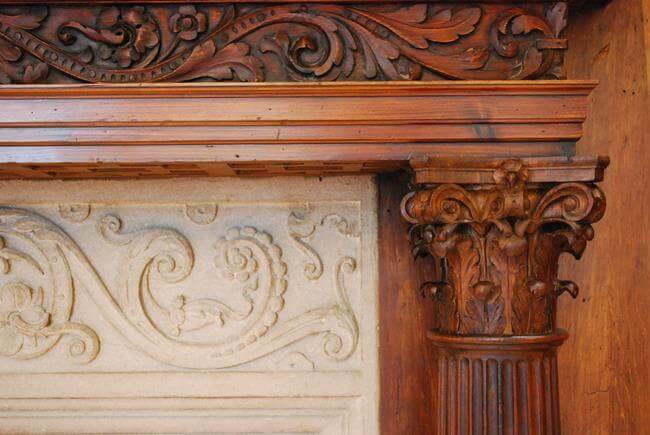 The restoration of the monumental wood windows brought about a discovery of past craftsmanship. After stripping the sash, it was discovered that at multiple units, the original glass at certain lights was cut too small and angled too sharply toward the corner of the sash frame so that there was not sufficient glass to cover the openings. 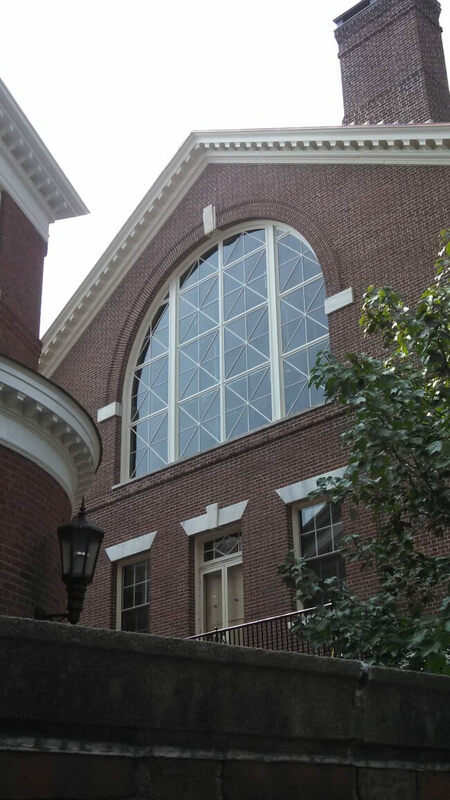 The existing panes had been secured with glazing putty, caulk, a quarter-round molding, and glazing points. In order to provide a proper re-glazing of these units, M&A supplied and installed historically-sensitive glass at these window sash. The project was completed in the fall of 2013, completing the restoration of the entire gymnasium, inside and out. 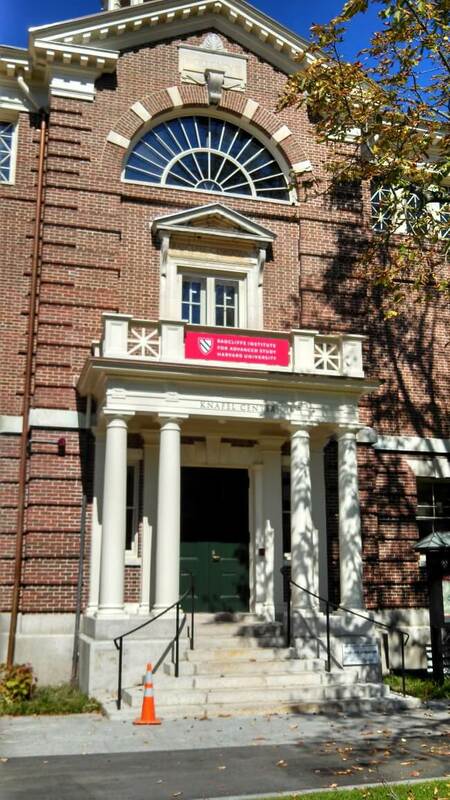 The Agassiz Theater is part of Harvard’s Radcliffe Institute. Built in 1904, the structure was originally home to Radcliffe College’s student center, and is now home to the Agassiz Theater, where hundreds of undergraduates partake in theater productions annually. A Greek Revival-style structure with red brick facades, the front portico consists of four monumental Corinthian columns and two pilasters supporting a flat entablature. 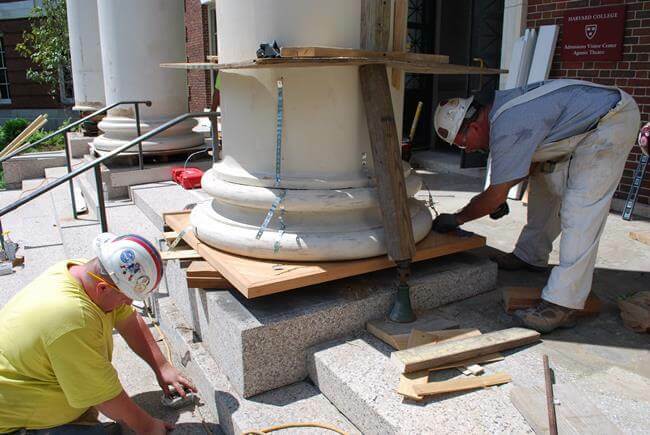 As part of an extensive exterior restoration, M&A was contacted to complete restoration of the columns and pilasters, including fabrication and installation of new monumental column and pilaster bases and installation of new capitals. 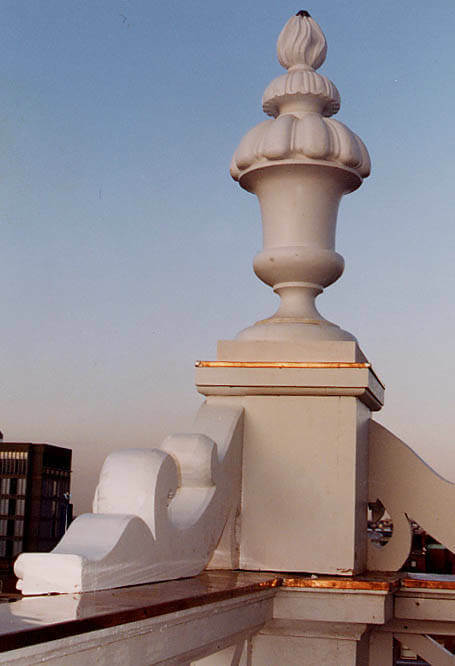 Due to water penetration, both the ornamental components of the capitals as well as the bases exhibited signs of cracking and deterioration. 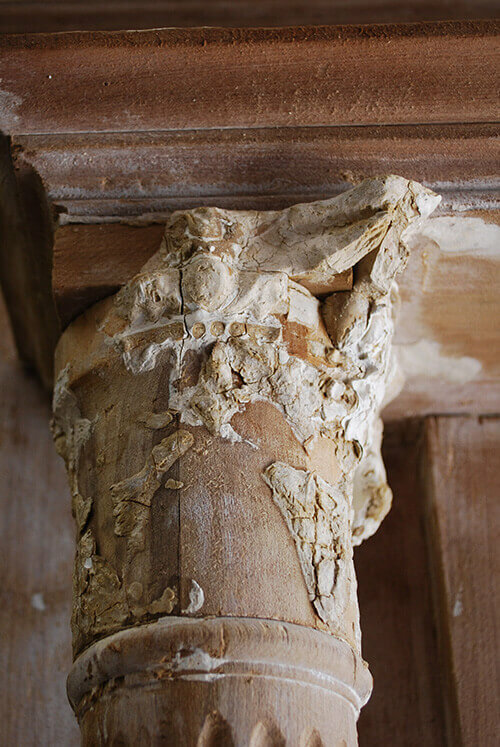 The pilaster and column capitals were exactly replicated by removing the existing capitals and casting molds. The project also involved restoration of three French doors in the historically-significant Horner Room as well as the 12-lite theater door. Opening out onto the portico balcony, the French balcony doors showed signs of deterioration and wear over time, particularly to the bottom rails. The theater door exhibited similar issues. M&A removed the doors, stripped them of existing paint, and brought back to their restoration shop for work. The existing glass was removed and historic replacement glass was installed to achieve an appropriate feel to the historically important room. Door hardware for these three sets of doors required the trained eye of Rich Muckle to assure it was both appropriate for the time period as well as functional. Due to the narrow width of the strike side stiles, Rich recommended the use of special-order lock bodies to replace existing, no longer functional ones. The cremone bolts (fasteners with vertical rods that move up and down and engage at the top and bottom of the frame via a central locking mechanism) were in poor condition—missing parts and pieces, inoperable components, and one was missing entirely. M&A’s metal specialist fabricated the missing elements and replicated exactly one entire cremone bolt while the preservation carpenters refurbished the existing components. The new and newly restored bolts were installed on the doors, ensuring the historic character of these doors remained preserved. M&A worked tirelessly and met the completion date of this project despite the extensive and varied work. 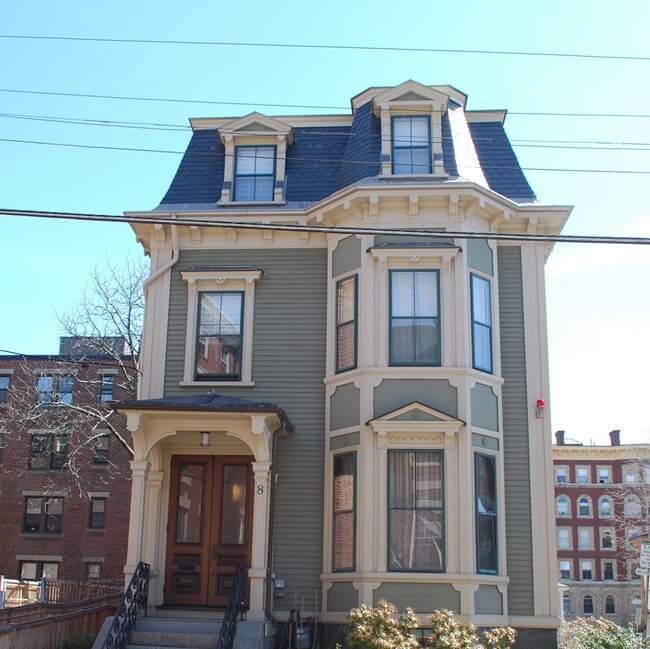 The project was praised by the local preservation community and received a 2015 Cambridge Historical Commission Preservation Award. 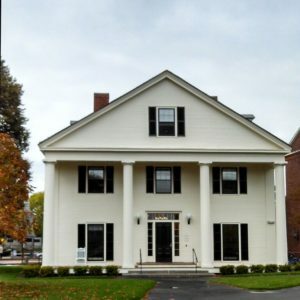 General Contractors: Lake Contracting, Inc.
Gannett House is the oldest surviving building on the Harvard Law School campus and home to the Harvard Law Review, a distinction it’s held since the 1920s. . Built in 1838 as a private residence, the Greek Revival structure was designed by architect Samuel William Pomeroy. Harvard Law bought the house in 1897, and it’s served a number of functions since that time, including student housing and a Naval Sonar Laboratory. The building, which originally faced south, was rotated 90 degrees to face east in 1938 in anticipation of a proposed mall, which was never built. The building underwent renovations in 1925 and 1980 before undergoing its most recent renovation. The interior of Gannett House was gutted and redesigned beginning in 2012. Completed in just over nine months, upgrades included an elevator, HVAC and electrical upgrades, and office space upgrades, as well as a new roof and windows. 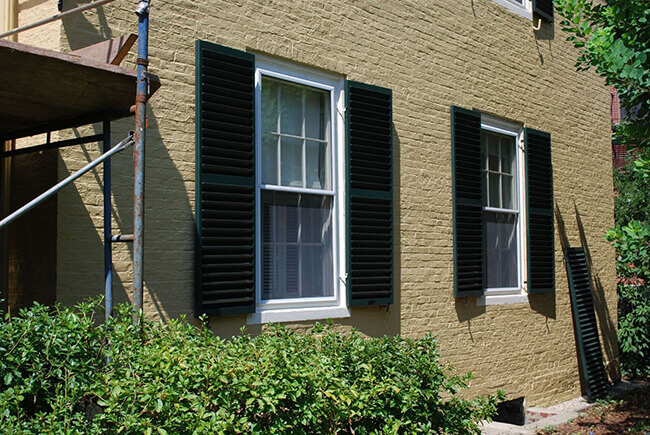 M&A performed window, door, exterior siding, and column restoration to the historic structure. On the east, the portico columns required attention. The column shafts themselves were in good condition, but the rectangular column bases and plinth blocks were demolished and replaced with new mahogany components that exactly matched the originals. After removing the existing base and plinth, M&A noted damaged to the bottom of one of the fluted column shafts, which sat directly on the rectangular base. Dutchman and epoxy consolidation was performed by M&A’s preservation carpenters to ensure the longevity of both the column shaft and the new base. 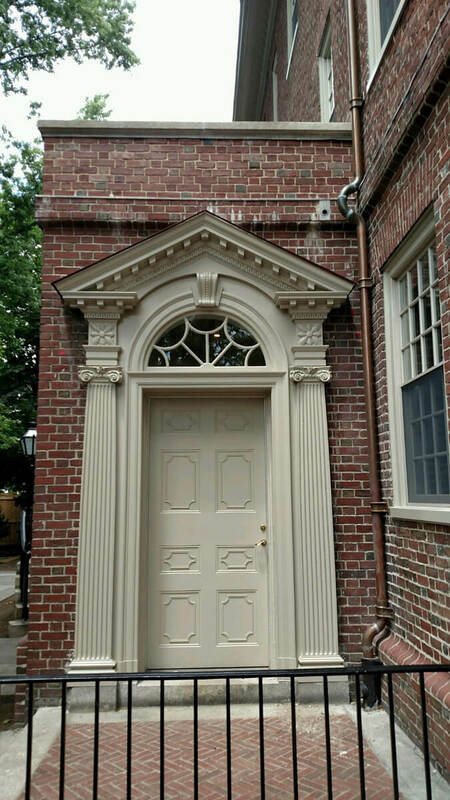 The grooves of the fluting were meticulously lined up between the existing historic column and the inserted wood Dutchman, and once painted, the differentiation between the new and old were indistinguishable. 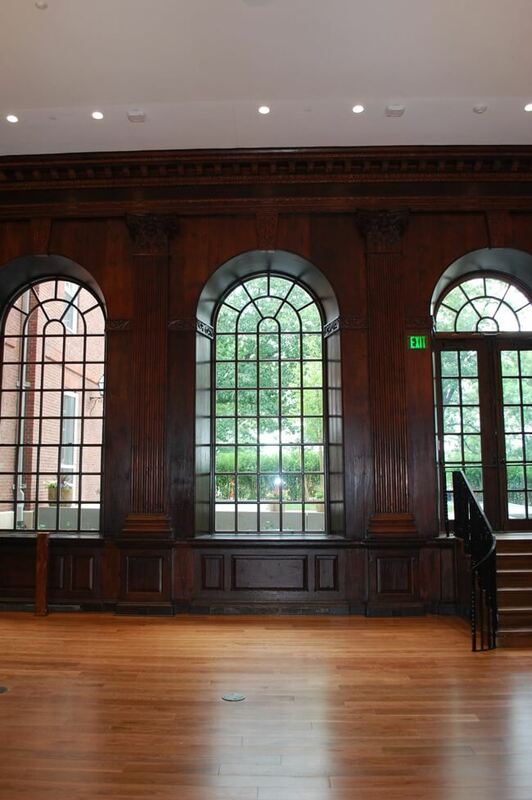 All windows were restored, which included removal of sash, re-glazing, and repairs to the wood frames. 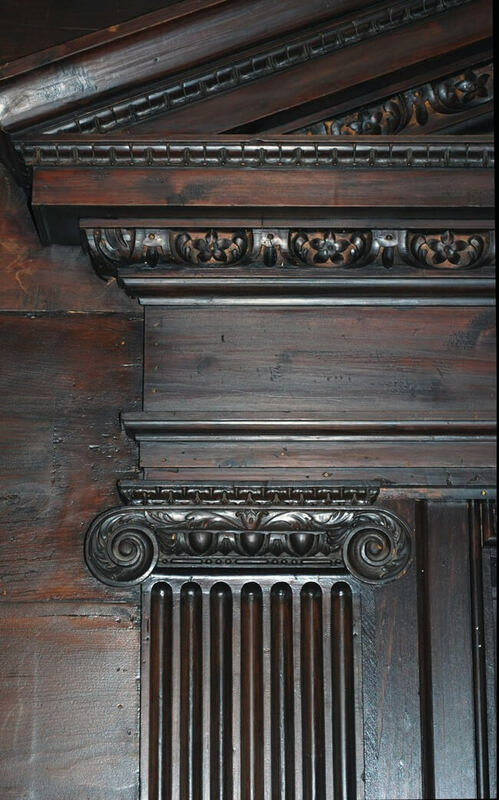 Jambs and sills were restored on-site. To properly document the work, M&A methodically documented existing conditions at each window opening. This involved completing a conditions survey, addressing any issues at interior stops, weatherstripping, hardware, glass, weight pockets, and observable sash conditions both during removal and after the paint was stripped, revealing covered issues. Previous repairs became exposed, which included the use of metal brackets to hold stiles and rails together where the tenon joints failed. Many of the sash were in extremely poor condition, with wood decayed to the point of exposing mortise and tenon joints. 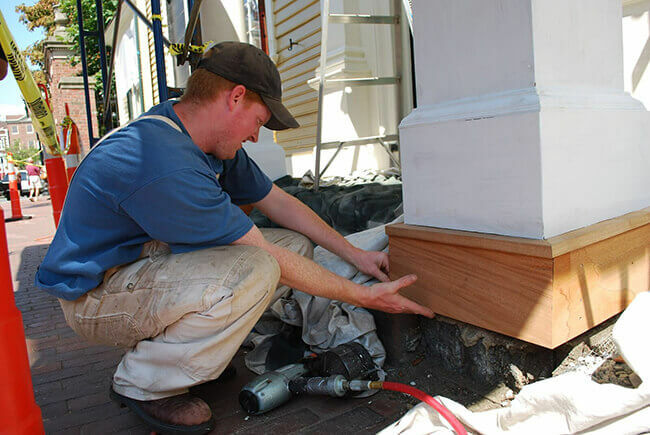 M&A’s preservation carpenters replaced stiles and rails that were beyond repair, and performed epoxy consolidation repairs at locations where they were able, saving as much historic fabric as possible. 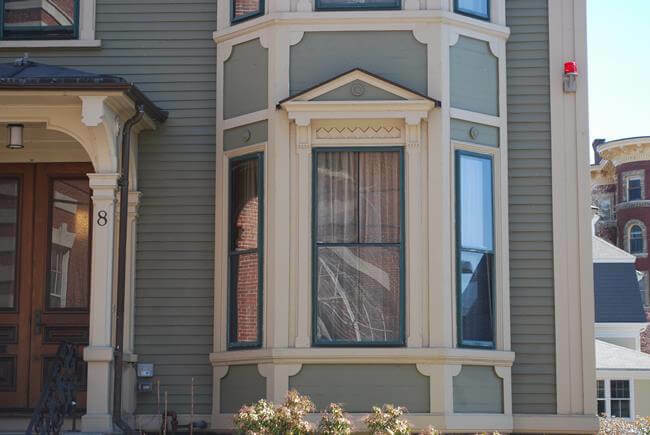 On site, the window jambs and sills were consolidated with wood epoxy, new parting beads and interior stops were fabricated, and the restored windows were installed with new sash cords to ensure ease of operability. 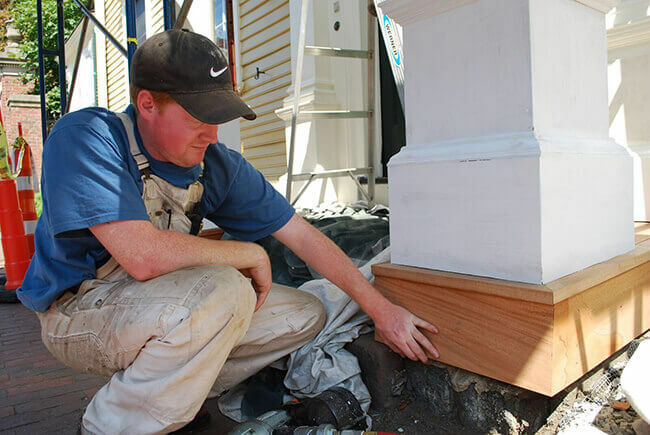 As the restored sash were being reinstalled, M&A’s preservation carpenters noted that some of the sash sat loose within the jamb opening. The existing sash were narrower than the jamb opening, which is atypical. As historically sensitive storm windows were installed, the issue of air penetration was less of an issue than that of operability. To remedy this problem, M&A recommended the use of two sash lifts at each operable sash, which encourages the user to exert equal pressure on both sides of the sash at the same time, and to lift from the bottom of the sash. 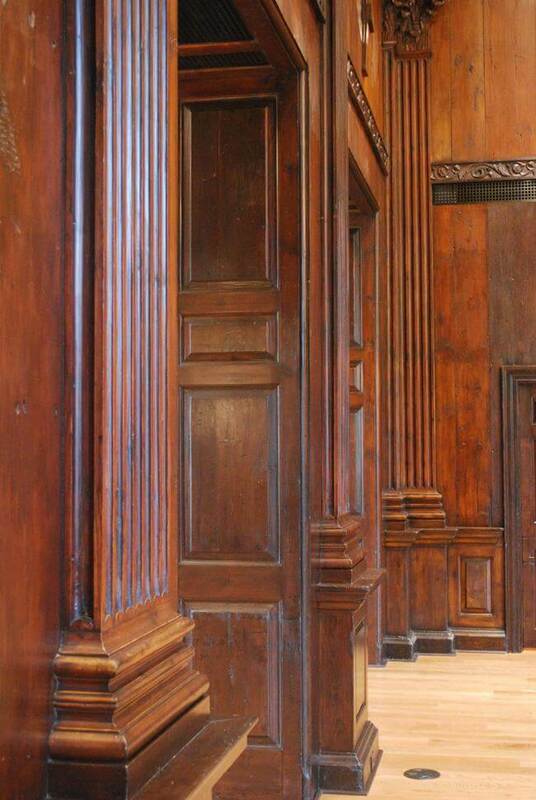 This solution ensured the longevity of the sash by preventing wear and tear on the meeting rails and muntins, which were being used to open the lower sash. The project was completed in August of 2013 and received LEED Gold Certification, proving that historic buildings, and their original windows, can be green buildings as well. 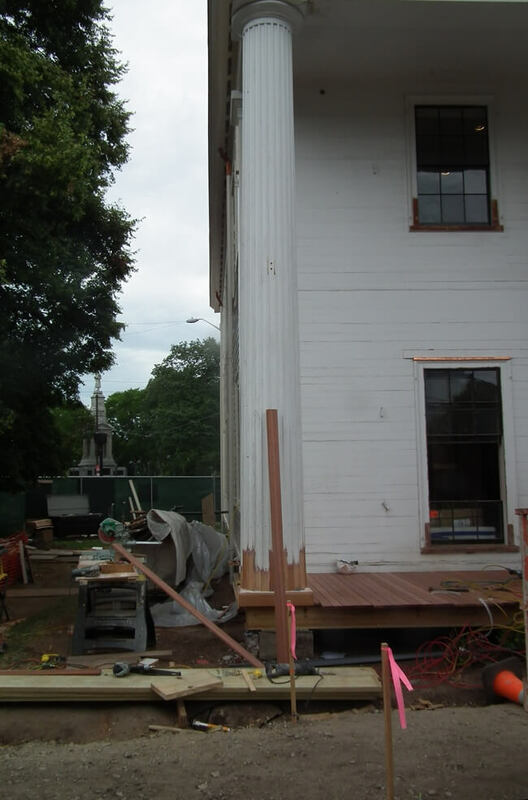 M&A’s Scope: Restoration of Wadsworth House windows, sashes and frames, shutters, front porch including columns. Structural repairs to the roof and replaced the framing and trim on the deck. 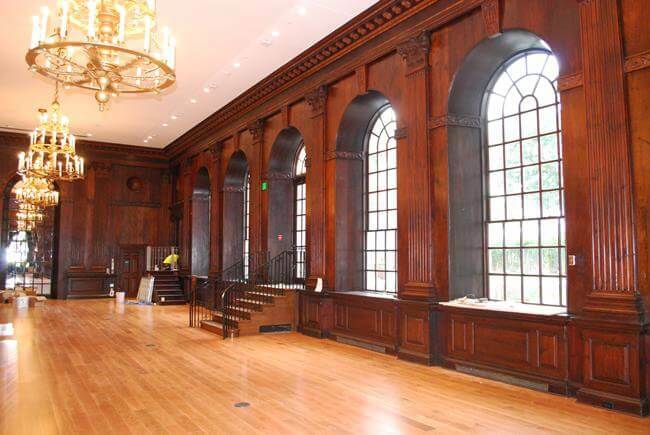 General Contractors: Lee Kennedy Co. Inc.
M&A is proud to have completed preservation and restoration work in 1998 and again in 2009 at the Wadsworth House, Harvard’s second oldest surviving building. Often referred to in University records as “The President’s House,” it was built in 1726 as a residence for Benjamin Wadsworth and his family. Nine Harvard presidents, including Wadsworth, Edward Holyoke, Samuel Locke, Samuel Langdon, Joseph Willard, Samuel Webber, John Thornton Kirkland, Josiah Quincy, and Edward Everett, lived in Wadsworth House between 1727 and 1846. In 1775, Wadsworth House was the temporary headquarters of Generals George Washington and Charles Lee. Many notable figures visited General Washington while he resided at Wadsworth House, including Abigail Adams and future speaker of the Massachusetts House, James Warren. Over the years, Wadsworth House has been home to students (including Ralph Waldo Emerson, AB 1821) and Harvard offices, including that of the University Marshal. Today, the Wadsworth House is home to offices of the University Marshal, Commencement and several professors. Restoration of all 110 wooden shutters, including rebuilding and replication where they had deteriorated beyond simple repair techniques. All shutters were removed and restored on-site at M&A’s shop in Lawrence, MA. 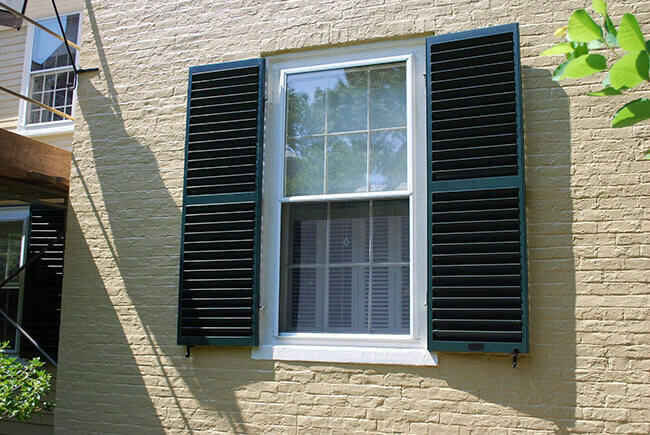 Each shutter was then reinstalled with original hardware restored and reused. Restoration of the front porch, including structural repairs to shore the roof and replace the deck, framing and trim. Columns were removed and taken to the M&A shop for restoration. 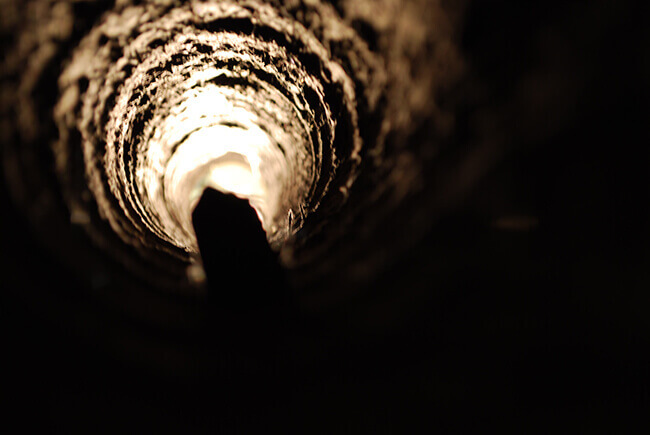 Notice the photo in the gallery of the hand-hewn column and its hollow interior! Exterior restoration work included soffit restoration and repairs to the original clapboard siding.